A good way to use up those Easter Eggs. This recipe handed down by my mother and grandmother, these are lusciously saucy meatballs, each with a hidden surprise in the center. It was one of my favorite dishes growing up. 1. In a medium bowl, combine beef, egg, rice, salt, and onion. Mixture will be soft. Form meat into 12 thin patties, each about 3 in. wide. Put a wedge of hard-boiled egg in center of each patty, then press meat around eggs, forming 12 balls. Cover and refrigerate while you prepare sauce. 2. In a blender or food processor, combine chicken broth, tomato sauce, chipotles, and garlic; blend until smooth. Pour sauce through strainer into a medium saucepan and add meatballs and bay leaf. Bring to a boil, then reduce heat to a simmer. 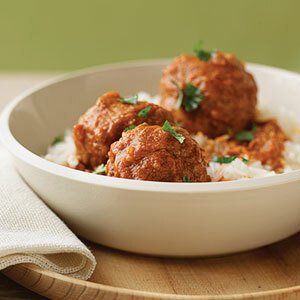 Cover pot and cook meatballs in sauce, turning occasionally, until they're cooked through, about 25 minutes. Pour over rice and sprinkle with cilantro.